Why aren’t your customers worth your time? After a recent stay at a hotel I came back from breakfast to find a 3 page survey on my bed about my stay. Why on earth should I fill it in? In such a busy world, fewer and fewer customers have time for this sort of thing. Most people hate filling in long surveys and will actively avoid doing so unless they are forced to. Particularly since, no matter how detailed you are in the form, the answers you give seem to disappear into a corporate black hole and nothing is ever actually done about your feedback. That hotel will never know what I thought of them, good or bad, because they wouldn’t put themselves out to ask me in a way that respects my time. The scheduled “annual customer satisfaction survey” and “feedback form” are becoming a thing of the past. 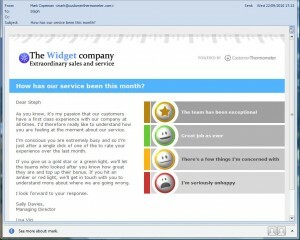 Customers want a quick and easy way to let you know how they feel – when it makes sense and matters to them. Not you. Monitor the responses. And then respond in real time to their feedback. Where things are going wrong, fix problems and apologise. Where things are going really well, reward your staff and do more of it. This approach is an early warning system, a customer feedback system and mood monitoring system all in one. And it takes the customer 2 seconds flat. Now that’s what I mean by respecting my time!